Abstract: Freckles, a 15 yr. old Australian shepherd x red heeler spayed female, was treated three times for neck pain and generalized musculoskeletal stiffness. The treatments included acupuncture, electroacupuncture, laser therapy and massage therapy. No ancillary diagnostics were available for this case thus limiting the capacity to address possible concurrent medical conditions. An improvement in comfort and attitude was observed by the owner and by the acupuncturist. Based on the perceived positive response to therapy, maintenance acupuncture treatments were recommended. History and Presentation: Freckles is a 15 yr. old Australian shepherd x red heeler spayed female that is a “retired” ranch dog. For the past two years, the owner has noticed that Freckles struggles to walk, is slow when getting up or lying down and spends long periods of time sleeping. Freckles is currently being treated with carprofen (37.5 mg, by mouth q 12 hrs.) and has been on this medication since May of 2016. The owner is aware of the side effects of long term use of non-steroidal anti-inflammatories in dogs, but has declined bloodwork since her initial visit to her attending veterinarian. Although client notes from 2016 include a charge for an in-house blood panel and the practitioner’s medical notes report a suspicion of diabetes, no copies of the bloodwork were made available to the client for this case report. 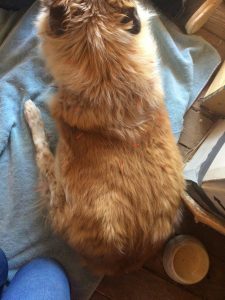 The owner reports Freckles was kicked by a horse in the left shoulder as a young dog, but appeared to recover without veterinary intervention. Freckles is an outdoor dog, intolerant of spending long periods of time indoors. She was presented for acupuncture because the owner wishes to keep her comfortable as long as possible. Physical Examination and Clinical Assessments: Upon presentation, Freckles was quiet, alert and responsive and able to rise from a lying position with effort. Her vitals were within normal limits (WNL). Her owner has not noticed any changes in appetite or drinking, No coughing, sneezing, vomiting or diarrhea were observed. Panting was constant. Eyes, ears, nose, and oral cavity were WNL. Palpation of submandibular lymph nodes, salivary glands and trachea were WNL. Abdominal palpation revealed a tense, moderately distended belly; tender in the cranial and mid-abdominal regions. Freckles was unwilling or unable to lie on her side so palpation of her joints was performed in standing. No deformities or asymmetries were noted but, based on her standing position, flexion of her limbs was limited. General muscle mass and tone were mildly decreased on the trunk and hind limbs, but appeared overly developed on the neck and front limbs. Gentle palpation of her vertebral column, back muscles and hind limbs revealed discomfort and pain. Peripheral lymph nodes were WNL. Freckles’ gait was slow, with stiffness evident in her neck (unwillingness to drop her head or turn her head to the left), difficulty ambulating, and a marked bilateral plantigrade stance. No proprioceptive deficits were noted. Vascular/Infectious: Diskospondylitis or osteomyelitis of hematogenous spread caused by bacterial, rickettsial, fungal or viral infection. Neoplastic: spinal cord, nerve sheath or bone tumors. Primary tumors (osteosarcoma, chondrosarcoma, myeloma) or metastases (lymphoma, melanoma). Peripheral neuropathic paraneoplastic syndrome. Degenerative: Cervical (C1-C5) osteoarthritis, thoracolumbar osteoarthritis. Iatrogenic/Intoxication: Intoxication with plants (boxwood) or poisons (snail baits, organophosphates). Autoimmune: Systemic Lupus Erythematosus (SLE), polymyositis, immune-mediated polyradiculoneuritis. Cervical syndrome (C1-C5) with corresponding myofascial pain syndrome. This is likely of a degenerative nature causing symptoms of pain and stiffness affecting ambulation. Unfortunately, there are no radiographs or additional diagnostics to confirm this working diagnosis. Clinical signs of cervical pain correspond to guarding and reluctance to move the neck in any direction, a stiff gait with significant muscle pain and reluctance to move and a normal mentation (Meij, 2005). Myofascial pain stemming from the palpable taut bands in the skeletal muscle can originate as a result of traumatic or atraumatic conditions (Mehul, 2013). Based on the lack of ancillary diagnostics, other infectious, neoplastic, endocrine, and immune-mediated components to Freckles’ condition cannot be ruled out entirely. Potential bacteria that could cause septic arthritis include Staphylococcus spp. Streptococcus spp. and coliform bacteria (Merck, 2005). B. canis can cause diskospondylitis with spinal pain, stiffness, lameness and neurologic deficits (Spickler, 2018). Rickettsial infections such as those caused by R. ricketsii or E. canis would also be potential diseases. Viral causes of spinal infection include the neurologic form of canine distemper. Coccidioidomycosis could course with initial stiffness and pain, but would more commonly present as paresis or paralysis (Merck, 2005). Most (if not all) of these conditions could be diagnosed based on blood work or cerebrospinal fluid. Further diagnostics would be required to identify or rule out neoplasia since tumors could display clinical signs similar to those observed in Freckles. Paraneoplastic syndrome eliciting signs of pain, reduced muscle tone and limb weakness with peripheral neuropathy could also be present (Meij, 2005). Intoxication is unlikely based on the chronicity of clinical symptoms, slow progression and lack of other systemic signs. Immune-mediated polymyositis, polyradiculoneuritis or SLE can present in older dogs as exercise intolerance, ataxia and weakness (Merck, 2005) and would require additional testing to confirm. Abnormal vertebral development would likely have been evidenced as a young animal instead of in the geriatric stages of Freckles’ life. Radiographs or magnetic resonance imaging (MRI) would determine if an old or new traumatic injury played a role in Freckles’ current presentation. Hypothyroid neuropathy where classical clinical signs of hypothyroidism are absent and neurologic deficits (tetraparesis, hyporeflexia, decreased proprioception) exist has been described in older dogs (Giza, 2016). This can be diagnosed based on blood work. 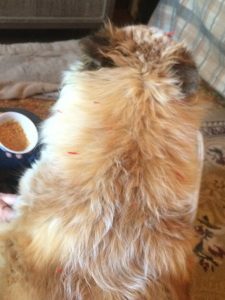 Medical Decision Making: Freckles was included as a case report in the hope that acupuncture and laser therapy would alleviate some of her discomfort. Because there is no bloodwork or information based on diagnostic procedures, treatment was defined as addressing the muscle tension and pain in her neck and back to help her ambulate. The treatment goal was to address trigger points and release the myofascia, improve neck mobility and decrease pain. The placement of acupuncture needles focused on locating cervical trigger points and taut bands to relieve tension and address referring pain. GV20, ST 36, were also stimulated as immunomodulators. Specific points such as GV 14 (session #2) addressed neck, back and front limb pain. Bai Hui addressed lumbosacral pain and hind limb pain. Acupuncture Treatments: Session #1 (5/23/18): Thirteen 0.16 x 30 mm coated Serin® needles were placed in the following locations: GV 20, four cervical spinal nerve points (two on either side of the neck along the omotransversarius muscles), GB 21 (bilaterally), BL 15 (bilaterally), BL 21 (bilaterally), GB 29 (left), and Bai Hui. GV 20 and Bai Hui were selected as calming points and for neuromodulation. All other points were selected based on the location of taut bands or trigger points. GB 29 was a sensitive point so pursuing the point on the opposite side was not attempted. Cross-talk of nerve fibers with the opposite side was anticipated. Acupuncture needles stayed in place approximately 15 minutes. The session was completed with laser therapy (5 minutes) and massage (5 minutes). Session#2 (5/27/18): Twenty (0.16 x 30 mm) coated Serin® needles were placed in the following locations: GV 20, GV 14, Bai Hui, ST 36 (left), BL 10 (bilaterally), in four of six cervical spinal nerve points, BL 13 (bilaterally), BL 15 (bilaterally), BL 17 (bilaterally), and BL 25 (bilaterally), and BL 52 (bilaterally). Two needles (0.20 x 30 mm) were placed on the two middle cervical spinal points of the left side of the neck and connected to the ES-130 Ito unit (channel 1) for five minutes at 2.5 mHz (continuous). The session was completed with a five-minute laser therapy and five-minute massage. Session#3 (6/10/18): Twenty coated Serin® needles (0.16 x 30 mm) were placed in the following locations: GV 20, ST 36, and Bai Hui. GB 20, BL10, four cervical spinal nerve points, BL 15, BL 17, and BL 21 were treated bilaterally. BL 13 (right), SI 12 (left) and LI 15 (left) had the same gauge needles. Two coated Serin® needles (0.20 x 30 mm) were placed on BL13 and SI 12 on the left side and connected to the ES-130 Ito unit (channel 1) for five minutes at 2.5 mHz (continuous). The session was completed with a five-minute laser therapy and eight-minute massage. Outcomes, Discussions, and References: Although there was little change in Freckles’ gait, there was a definite improvement in the muscle tension around her neck and shoulders. Her level of comfort improved during therapy and maintained between sessions. After the second massage, Freckles came to me wagging her tail and nudged my hand, so massage time was a bit longer than usual. I did learn that (as described in the course) keeping the Ito unit attached is impractical because the weight of the clips tugs on the needles so only the left side (the most affected side) was treated. In a different scenario, comprehensive bloodwork would have been performed to determine other underlying causes of discomfort that could be radiating to her back and belly. Giza, E., Plonek, M., Wrzosek M. (2016). Electrodiagnostic studies in presumptive primary hypothyroidism and polyneuropathy in dogs with reevaluation during hormone replacement therapy. Acta Vet Scand., 58 (32). doi: 10.1186/s13028-016-0212-9. Merck Veterinary Manual 9th Ed. (2005). Merck and Co. Inc. Whitehouse Station, NJ.